One of my untyped, until now, resolutions is to get the mess under control. I'm not the neatest person in the world. When I go some place that needs kitty sitting services, I scramble to clean my house, lest Pam think I'm a pig. Plus, I like coming home to a neater house. I live by the adage, "Clean enough to be healthy. Dirty enough to be happy." Some things are organized, if a bit untidy. Take the hall closet. Winter stuff is in the bin on the top. 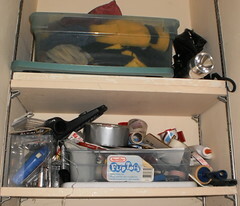 Miscellaneous items, like batteries, lint roller, glue, thumbtacks, duct tape and other assorted things are on the bottom shelf. They are sort of contained in the bin and container. I probably could go through this and get rid of over half of the items there because I don't use them. It's a matter of making myself do the cleaning. I have other spots in the house that really need to be sorted through. The table in the living room contains a variety of cookbooks, a box and my current correspondence. I sometimes eat in the living room at this table. It's my working space. It's cluttered. One of my goals is to have this space cleared by the end of the month. The cookbooks may not go by then, but everything else needs to be. That will force me to write more letters. There is a table in the home office that is overflowing. I'm sure there are unanswered letters in the pile, perhaps an unpaid bill that I misplaced but have since made good on. I see a couple of packages and a couple of magazines. I would love to take the table down. It was put up in 2008 and I just started tossing stuff on top of it. It stands as a stark reminder of how disorganized I allowed myself to become. "I'll get to it," was the motto. I don't want to get to it. I want to retrain myself to deal with it now. Part of this is a conscious effort to shake off some of the clutter with which I have surrounded myself these many years. I find myself frustrated when I can't find things, frustrated that deadlines pass and I miss them because whatever I needed was in a pile, frustrated that there is a pile in the first place. I'll never be neat and tidy. I took pride in the fact that I was organized. I might have a "piling" system instead of a "filing" system but I knew where everything was and could find it at a moment's notice. That's not me anymore and is a source of frustration. So, I have given myself the requirement that I do a little cleaning on the piles every day. When I bring in the mail, I have to deal with it directly, not drop it in a pile to be looked at later. I have a spot for bills. That's where all bills need to go. I have a spot for letters, but the best course of action is to answer them right away. Other things that might need attention must get it immediately and not be put off. If I spend 30 minutes to an hour each day working through a small corner of a pile, it will be gone. I tell myself this. I promise myself this. It will be gone eventually. I've read where it takes 2 months of doing something repetitively to make it a habit. We'll check in come March and see if the piles have dwindled. I'm going to look on this as an archeological dig, in my own home. What treasures will I find awaiting me at the bottom of the pile?